Published: September 10, 2014 • Modified: October 15, 2018 • by Author: Analida • Word count:691 words. • About 4 minutes to read this article. 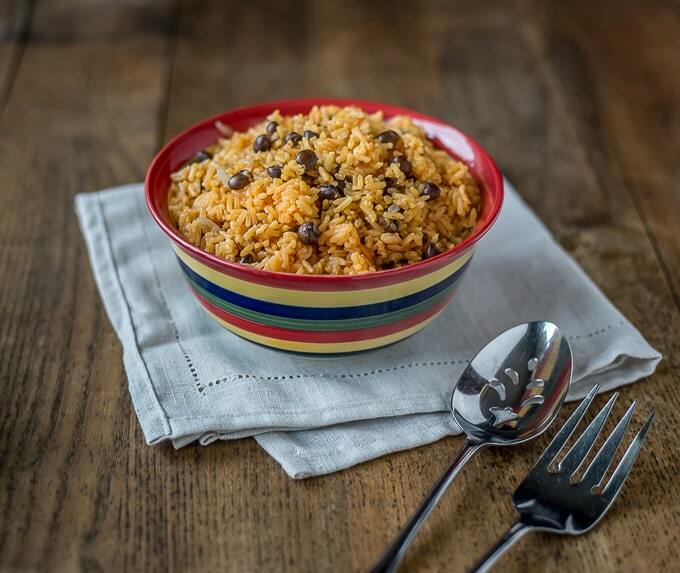 Arroz con Gandules is a Puerto Rican favorite. It’s also popular in other Latin American countries. 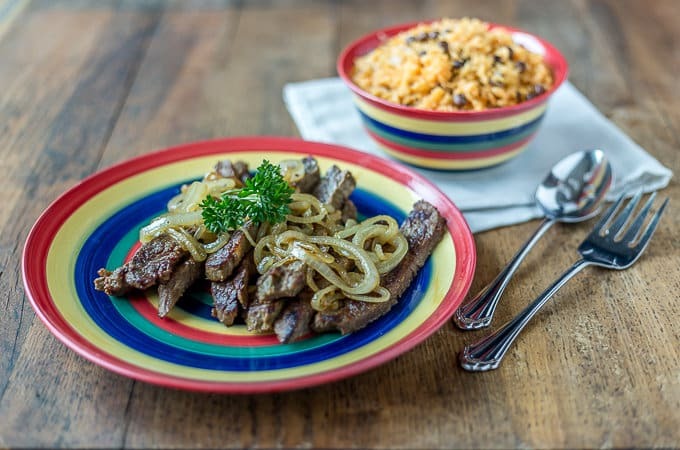 As an added plus, arroz con gandules goes amazingly well with bistec encebollado. Gandules or Guandu depending on where you are from, are a small roundish bean that grows in a perennial bush. There are three different types of gandules (aka guandu): black, green and striped. 1. They can be dried and ground into flour. 2. The hedge grows to be about 5’0″ . 3. When pruned the nodules release nitrogen which is good for other plants nearby. 4. They are high in potassium and are a good source of protein. (guandu) is mixed in with a coconut rice. Puerto Ricans make it a totally different way and I like their way better than the version I grew up with. Not that I don’t like coconut rice, I love it. , bacon and chicken stock to flavor their arroz con gandules. If it has bacon, how can it not be good, right? You can purchase Goya sazon at the store or try making your own. Goya’s sazon is a great product and by the way, sazon is the generic word for seasoning in Spanish. I am including my own blend of sazon at the end of this post. Because it is next to impossible to purchase fresh gandules where I live, I often seek out a couple of different brands: Goya and El Jibarito. The quality of both products is consistently good. 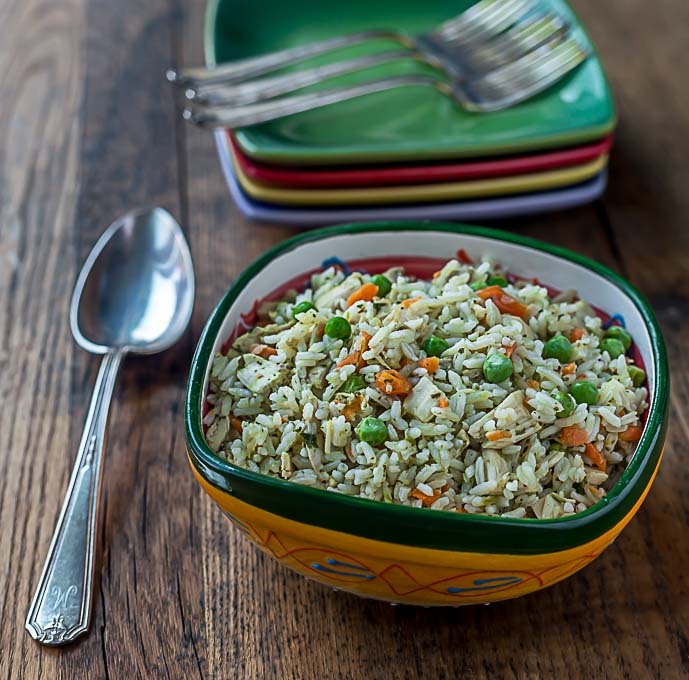 If you are making a small batch of rice, you only need to use 1/2 the can and you can freeze the rest in a container for later use. Make sure you freeze them in a little water so they don’t get freezer burnt. 1 Tbsp. of each ingredient below. Mix well and store in a sealed jar in a dark place. Mix well and store in a sealed jar in a dark place. come from the seeds of the achiote tree. They impart a reddish color on the food. You can find this spice in the ethnic section of your store or in specialty markets. Of course, you can also get it online! If you love Latin food then you have to try some of my all time favorite dishes or bookmark them for later. Here are some of the most popular Latin American ethnic dishes, their history and ingredients to make at home. Recaito: This is the cilantro based ingredient used in many Latin soups, stews and black beans. 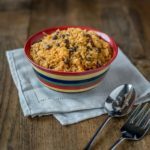 Latin Style or Cuban Black Beans: If you have never tried these you are missing out and they are so easy! If you try any of these recipes leave me a comment. I would love to hear from you! This is a Puerto Rican favorite, present at almost every meal. 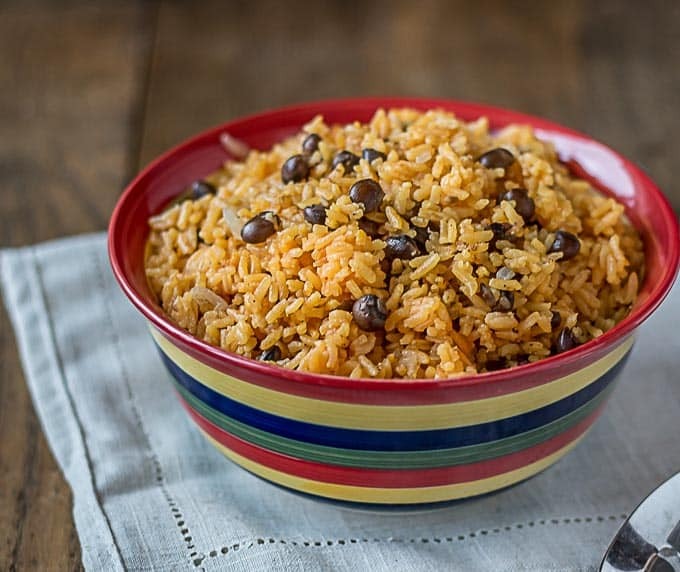 The earthy taste of gandules (pigeon peas) is combined with sofrito and rice for a perfect side dish. In a 6 qt pan on medium heat saute onions and bacon in olive oil oil for about 5 minutes. Add the gandules and stir quickly for about 3 minutes Immediately add the rice, sazon, water and broth. Bring to a boil. Turn heat down to medium and cover.Cook for approximately 20-25 minutes. Fluff, sprinkle with parsley and serve. **You can freeze the guandules in a little water if you make a half recipe. 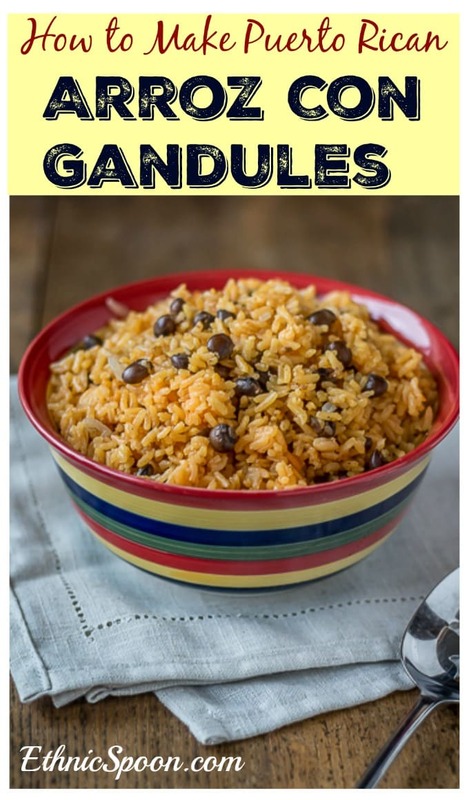 Love your explanations of gandules and instructions on how to make homemade annato. 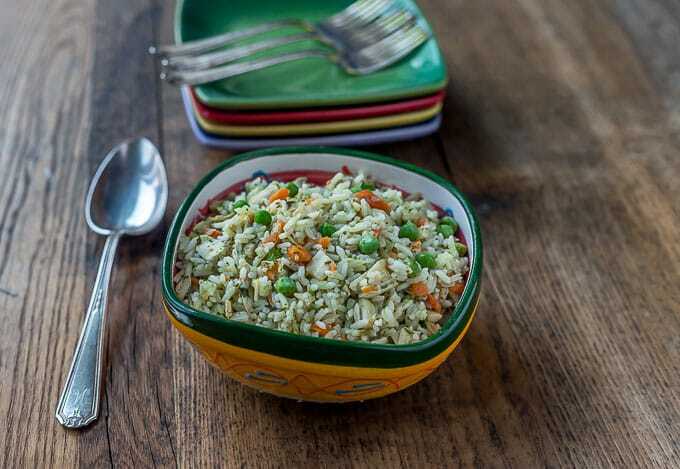 I’ve had this rice in restaurants and it’s yummy, but have never tried it at home. Now I can! Many thanks. You are welcome Laura, I hope you do try it at home. Hi, please clarify — use slab bacon and salt pork or it’s a choice? And how much salt pork?? It’s a choice. Salt pork tends to be saltier. If you use slab bacon, I usually use about 1/3 cup. If I use slab bacon, then I use 1/4 cup. This one of my all time favorite dishes and I loved making this one. Thanks!